The Camino de Santiago, a network of pilgrim trails, attracts more and more people every year. But, have you ever considered walking it with your family? Children can also enjoy the trip if you take some practical steps to ensure everybody has a fun time. Walking the Camino de Santiago with your family can be a unique and bonding experience. There is no minimum required age to walk, and there are a lot of paths suitable for all ages. A family with toddlers and young kids are a minority on the Camino. However, this is not an impossible voyage. As with any activity combining travel and children, planning is essential. Baby carriers will be a great choice for infants and hiking-specific backpacks for toddlers. If you are carrying your child, consider paying for the luggage transfer service. Your backpack will be delivered to the next albergue for 3 to 7 euros. You can also choose to push your child in off-road strollers or carts. Protect your child from the weather elements and plan ahead for the best sections of the trail. The route used by the pilgrims who ride a bike is a good choice for parents using strollers or carts. On some sections of the Camino, there is little shelter from the sun. Ensure your children wear hats and strong sun-block. Pack lots of water and make sure your kids drink it at regular intervals. Just to be sure, avoid the Camino during the height of summer, walk it in spring or autumn when the weather is more pleasant. Make sure your family has comfortable footwear that has been broken in. It’s not fun to deal with blisters along the way. Leave your fashionable clothes at home and bring clothing appropriate for hiking. The Camino Frances can be easily broken into sections which makes it perfect for families with children. This route has more services and accommodation especially in the last 100 kilometres, which can come in handy if your children get tired of walking. Maybe the section from Arzua to Santiago de Compostela would be the best choice. 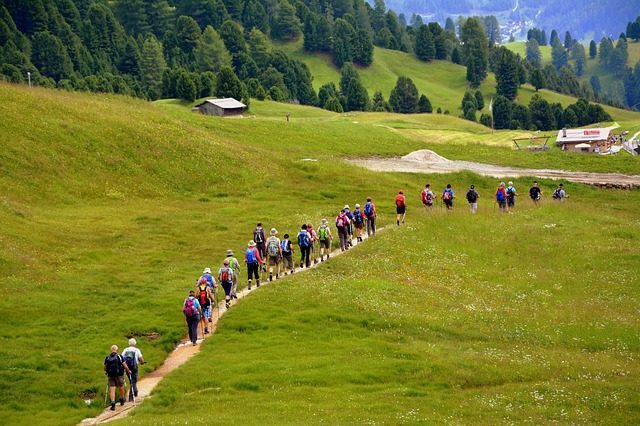 Walking 37 kilometres over four days shouldn’t be too hard for the kids. Children can enjoy the beautiful natural landscapes of Galicia, the eucalyptus woodlands as well as the urban environments such as Santiago de Compostela. It is important to motivate them along the way. Set reasonable targets for the day, so frequent stops are required. You can also bring a pack of cards, some other games or a book or two, to improve their mood when they are feeling down. Having a variety of snacks will be useful, too. While teenagers should be able to overcome the exertion, some parts of the Camino can be hard for younger children. If it is possible, prepare them for the trip by practicing sports. Bring a first-aid kit for blisters and wound care, as well as a pain reliever for you and your children. Most albergues don’t supply sheets and towels. Consider bringing them along with a pillowcase, or bring a lightweight one-season sleeping bag. You won’t be needing this if you plan to stay in hotels. Some pilgrims believe you need to leave all electronics behind, so you can fully experience the Camino. Only you can decide whether to carry the devices or not. Avoid things you won’t be using. Pack as light as possible, bringing only essential items. There will be plenty of opportunities to purchase anything you have forgotten or ran out of. Depending on the route and accommodation, the Camino de Santiago can be rather affordable. Most pilgrim budgets fall within the 25-50 euro per day range. The cost to walk the Camino Frances is about 35 euros per person, per day. That includes staying at pilgrim hostels or albergues (10 euros on average) and eating in restaurants. You can save money by staying at albergues with kitchen facilities. That will give you the opportunity to make your own meals and coffee, instead of eating out. Since a pilgrim spends about 20 to 25 euros for food and drinks, that can significantly lower the cost. Have in mind your children’s temperament, when deciding where to stay. Sleeping in hostels or albergues can be an amazing experience for them. However, some albergues do not allow children. If you decide to stay in this type of accommodation, make sure they are not disturbing other pilgrims. Many private accommodation options offer family rooms with three or four beds. You can consider boutique hotels, hostels and camping as other options. It can be quite rewarding spending your holiday camping with your kids on the Camino. You’ll get to spend some quality time with them, without the distraction of technology. Take it as an adventure, and enjoy the landscapes, history and culture along the way. It is the perfect way to discover new things with them. This entry was posted in Travel with Kids and tagged spain travel, travel blog india, travel with kids india. Bookmark the permalink.